As we age, the skin of the forehead gradually loses its elasticity and pronounced forehead lines and wrinkles can appear. The eyebrows can come to rest at a slightly lower position (brow ptosis) which may exacerbate heaviness of the upper eyelids. The individual may have a permanently tired or prematurely aged look. Although this is usually seen in people of middle-age or older, the problem can be there from the start in younger people with a genetic predisposition. Important: Any surgical or invasive procedure carries risks. Before proceeding, you should seek a second opinion from an appropriately qualified health practitioner. Whilst Anti-wrinkle injections can reduce the appearance of lines and wrinkles on the forehead and help lift the sagging brow to a degree; in some people the brow has drooped to an extent that the upper lid can become “hooded” with the appearance of excess skin above the eyes. The person may look tired and older than their real age. Brow lifting is a surgical procedure where the tissues of the forehead are lifted to a higher position, raising the eyebrows to give a more youthful and rested appearance. What does a brow lift operation involve? In our Perth clinic, brow lift surgery is carried out as a day procedure. Fluid containing local anaesthetic is placed in the brow to reduce patient discomfort as well as reducing bleeding during the operation. The tissues of the forehead are freed through the small incisions in the scalp. The forehead tissues are then lifted to the desired position and fixed in place before the incisions are closed, usually with dissolving stitches. Brow lifting is frequently combined with other rejuvenating procedures such as blepharoplasty (eyelid surgery) and face lift surgery. How will I feel after brow lift surgery? How quickly will I recover? Most patients tolerate the procedure extremely well and are allowed to go home within a few hours. Oral pain killers and antibiotics are routinely prescribed after the procedure. Most of the bruising and swelling associated with surgery settles in the first 1-2 weeks and many patients are able to return to normal activities at that stage. Is brow lifting safe? What are the potential risks? With careful patient selection, adherence to pre and post surgical instructions and proper surgical techniques, these potential risks are minimal. Bleeding under the skin (haematoma) – with the use of a local anaesthetic solution possessing anti-bleeding properties and careful surgical techniques, this problem is seen less frequently. It is relatively more common in men undergoing this surgery, smokers, and in patients taking blood-thinning medication such as aspirin and other non-steroidal painkillers such as ibuprofen (Brufen) or diclofenac (Voltarol). These medications are therefore best avoided pre and postoperatively. Numbness and nerve damage – some numbness of the brow itself and the scalp above is usual in the early phase after treatment. A feeling of “pins and needles” is normal as this sensation recovers. The motor nerves which move the face must be carefully protected in any facial rejuvenation surgery. Cases of damage to these nerves have been described in medical literature, however it is exceedingly rare. Hair loss – hair loss is rare with careful technique and more common in smokers. Where is does occur it is typically seen on the scar itself and settles slowly over a few months. Infection – with all surgical procedures, infection occasionally occurs and antibiotics are sometimes needed. With the use of prophylactic antibiotics, this complication is extremely rare. Slow healing – scars from facial rejuvenation surgery usually heal very well and quickly. Occasionally the wound may be slow to heal. This is fortunately rare even in smokers who are the patients at slightly higher risk of this problem. Scars – the scars resulting from brow lifting are usually very well hidden and the patient can wear any hairstyle he or she wishes. In a small proportion of patients the scars can thicken somewhat usually in the first couple of months (hypertrophic scars) and may need some additional treatment to encourage them to settle. Most people opting for Brow lift Surgery are also candidates for some other cosmetic procedures like eye lid surgery, face lift, neck lifts and skin resurfacing. At Medaesthetics® we offer our signature make-over packages, for patients opting for more than one procedure. For the appropriate patient, brow lifting can give very pleasing, long-term results. It can be particularly effective when combined with other facial rejuvenation procedures. With careful planning and attention to detail a less tired, more youthful appearance can be achieved. 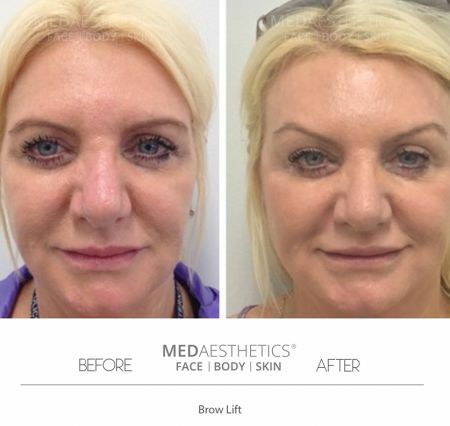 Why choose Medaesthetics® for your Brow lift Surgery in Perth? All images displayed on this website are property of Medaesthetics®. Formal Consent has been obtained from respective individuals (where required) who’s images have been used. Before/after photos are of actual Medaesthetics® patients and are for reference purpose only and are subject to Copy Right laws. Individual results may vary.